W1AW, the call sign of American Radio Relay League (ARRL) founder Hiram Percy Maxim, lives on long past his death in 1936 as the call sign of the official ARRL broadcast station located in Newington, Connecticut. Two of the ARRL's main qualifications for status as a 501(c)3 entity are its public services and educational aspects. Broadcasting practice Morse code messages has always been a service (and educational tool) provided for Amateur radio operators of all statuses from rank beginner working toward his/her first license to the seasoned 50 wpm veteran bugmeister (code proficiency is no longer a requirement for any license level). 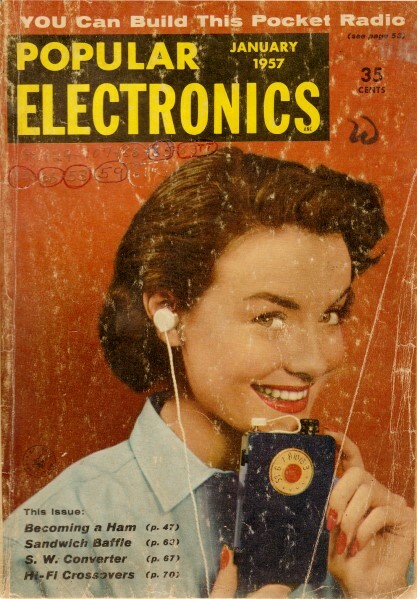 The people and equipment have changed since the article appeared in a 1957 edition of Popular Electronics, but the fundamentals have not. 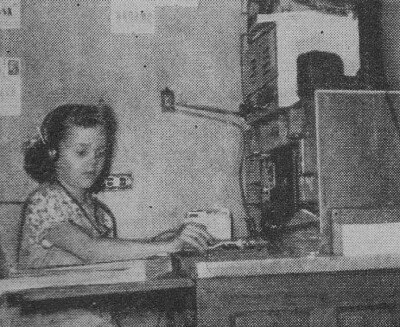 Every evening, from a short-wave radio station in Newington, Conn., the letters "QST QST QST de W1AW W1AW W1AW" ring out crisply in International Morse Code, calling to order a unique class­room of the air. Responding to the call are doctors and housewives, truck drivers and bankers, teachers and machinists, engineers and school children in cities and towns throughout the country. 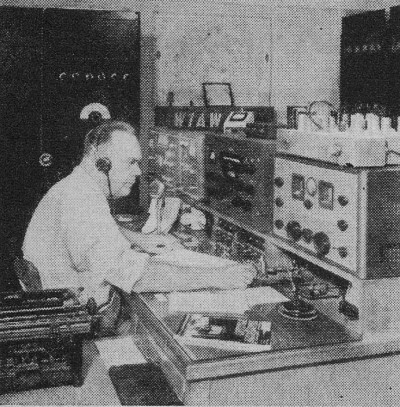 Each sits in front of a short-wave receiver, pencil in hand, translating the dits and dahs of radio code into English letters and words. Their common objective is to acquire sufficient skill in code reception to pass the Federal Communications Commission examination for an amateur radio operator license. The "teacher" of this code class is a machine which uses a punched tape to trigger the seven short-wave transmitters. "Final exams" are given once a month, when station W1AW conducts its code proficiency certificate session. One minute of perfect copy is required for "graduation" at any particular speed, in 5-wpm steps from 10 to 35 wpm. Anyone is welcome to make use of the code practice, and to receive a certificate of proficiency, without charge, upon sending qualifying copy to the American Radio Relay League in West Hartford, Conn. The League conducts the program as one of its services not only for amateurs, but for those wishing to join the ranks of the na­tion's 150,000 "hams." 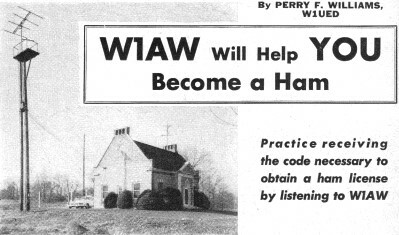 Practice receiving the code necessary to obtain a ham license by listening to WIAW In the United States, the FCC is in charge of issuing amateur licenses after an examination in code, radio theory and regulations. One of the tests is simple enough to have been passed by children of seven, while another is so tough that professional opera­tors have been known to fail it. 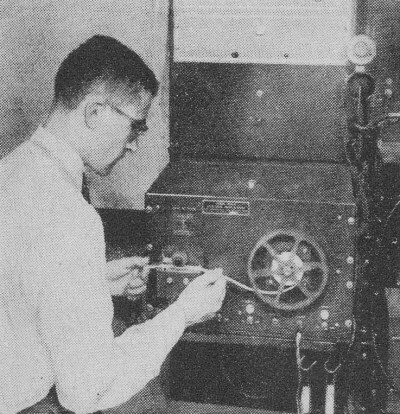 At W1AW, the operator adjusts the tape transport mechanism for the daily code lessons. These lessons are transmitted in the radio amateur bands. The operating position at W1AW includes a variety of standard-brand radio amateur receivers and transmitters. Both phone and c.w. are employed. Being a radio amateur attracts all ages. 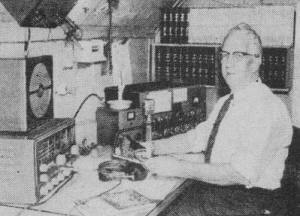 C. N. Crapo, of Milwaukee, Wis., has held the same license since 1920; his call letters are W9VD. This young lady received her license when she was seven years old; she is Sharon Pakinas, of Bothell, Wash., and her call letters are WN7UOH. Most newcomers-more than 25,000 last year-start with the Novice license, requiring a code speed of five words per minute, and a simple written exam. Though it is valid for only a year, and grants limited privileges, the Novice license provides the thrills of two-way communication using one's own private radio station in the cellar, attic or living room. Quite a few Novices have "worked" (ham lingo for contacted or communicated with) all 48 states; several have reached all six continents and as many as 50 countries during their license period. You don't have to travel a long way to try either of these exams. The papers are obtained from the nearest office of the FCC, and any amateur holding a General (or higher) Class license may serve as the examiner. Government and commercial radio telegraphers can conduct the tests, too. The next step, and one which most hams regard as their goal, is the General Class license. The written exam is a little tougher and a speed of 13 wpm is necessary. With this license, an amateur may operate on any amateur band, using phone (voice), c.w. (code), radioteletype, or other forms of communications authorized on some bands. Choice of Activities. Not only does the amateur have a choice as to the bands and types of signals he uses, but there also is a variety of activities available to him. The largest group is the "rag-chewers," congenial fellows who like to strike up conversations over the air with almost anyone, be he in the next town or halfway across the globe. Then there are the "DX hounds." These fellows aren't too interested in chatting with the ham in the next state; what they want is contacts with amateurs in exotic places like Tibet, or Gambia, or Qatar, or Niue. There's a special award highly regarded by the DX'ers, the DX (distance) Century Club, issued by the ARRL for submitting proof of communications with 100 or more different countries or territories. Amateurs regularly exchange colorful postcards confirming radio contacts, and these are submitted for the DXCC and for other awards. "Traffic men" are hams who meet at regular times on a certain frequency to relay messages for each other and for the general public. A typical message might be from a Yale student to his folks in Ohio wondering what happened to his laundry; another from a "boot" at Great Lakes Naval Training Center telling his girl in Miami that he'll be home Friday; and a third from W6XXX in Los Angeles to W7XXX in Phoenix asking him to listen on 50 mc. at 9 p.m. Wednesday. Many of the message relayers are members of the National Traffic System, set up by the League; all take part merely for the pleasure of snappy, purposeful operating. The FCC forbids amateurs to accept any sort of pay for services performed as hams. Still another group is interested in emergency operation. These hams hold regular drills once a week or oftener, to keep themselves in trim for the real emergency, be it fire, flood, hurricane, blizzard, tornado, explosion or enemy attack which may some day hit their communities, tearing up normal communications facilities in the process. With their equipment powered by gasoline generators or batteries, they are ready to fill in whenever called upon. Their organization, the Amateur Radio Emergency Corps, sponsored by the League, is the backbone of the official civil defense communications system, The Radio Amateur Civil Emergency Service. What ARRL Is. Most hams, of course, have two or more of these interests, and split their operating time among them. They all have in common the American Radio Relay League, a non-profit, non-stock membership corporation with headquarters at 38 LaSalle Road, West Hartford 7, Conn. Anyone interested in amateur radio may become a member, but voting membership is restricted to U. S. and Canadian amateurs. The headquarters is a beehive of activity. About 65 paid employees, including 27 hams, are engaged full time in coordinating the work of volunteer amateur appointees, conducting contests and other activities, designing new equipment to be described in the League's monthly magazine QST and in the "bible" of hamdom. The Radio Amateurs' Handbook, and in producing and distributing other inexpensive booklets to help amateurs learn about and improve their hobby. Especially important for the beginner is the "Gateway to Amateur Radio" package, including Learning the Radiotelegraph Code, How to Become a Radio Amateur, The Radio Amateurs' License Manual, and Operating an Amateur Station. 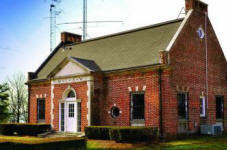 Headquarters also distributes free information on getting started in amateur radio. Four miles away is the Hiram Percy Maxim Memorial Station - W1AW - which is owned by the membership, and was built to honor the famed inventor who was the co-founder of the League in 1914 and its president until his death in 1936. The call letters were his own, and were assigned to the League in commemoration by a special action of the FCC after "The Old Man" died. Sparked by the ARRL, amateur radio has seen a tremendous growth through the years. Fifty thousand hams held licenses in 1941. Fifteen years later, in 1956, there are 150,000 hams - and more are coming. They're bound to - for as any ham can tell you, no other hobby can match this one: the fun of the rag-chew, the excitement of a contest, the thrill of working a new country, the satisfaction of smooth-running "home-brew" equipment, and that wonderful useful feeling which comes from message-handling and emergency work.